In comparison to the rest of this week’s three-game series against the Atlanta Braves, the Washington Nationals played poor defense and dropped a winnable game 5-1 after a ninth inning collapse. It didn’t help much that the offense struggled with runners on-base either. Atlanta started to tack on their runs in the fifth inning. Starting pitcher Ross Detwiler issued a walk to Braves starter Kyle Medlen that served as a catalyst for the two-run rally. Second baseman Tyler Pastoricky and Medlen scored on a double to right-center field hit by outfielder Martin Prado putting the Nats in a 2-0 hole. Washington stuck it out until the ninth, initiating what could have been a comeback in the eigth inning when the game was still within their reach. Atlanta only managed to score two runs before their three-run rally in the top of the ninth against reliever Tom Gorzelanny, but the Nats could only manage one run the whole game. Outfielder Bryce Harper scored the Nats only run in eighth on a single hit to left field by outfielder Michael Morse off Braves reliever Eric O’Flaherty, making it a 2-1 game. 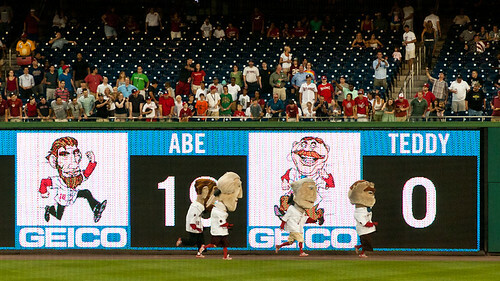 But that was before a ninth inning got away from Washington. While some of the evening’s missteps should be attributed to the fact that Detwiler didn’t make it long enough for a quality start, it didn’t start out that way. Detwiler cruised through the first four innings, having given up just three hits in that time, with two of the runners making it scoring position without making it home. His fast ball was absolutely dominated. So what was his biggest weakness? According to Manager Davey Johnson, Detwiler didn’t mix in enough off-speed pitches to get the job done. Because, no matter how great his fast ball is — and it was great for the first half of the game — Johnson says you still need to mix in the off-speed stuff. Detwiler only made it 5 and 1/3 innings, having given up seven hits, two earned runs, and one walk. He threw 78 pitches, 51 strikes, and struck out four. That’s when Craig Stammen entered the game for 1 and 2/3 innings of no-hit ball. The ninth is where it got messy. It was Gorzelanny’s second inning of work. He managed to get through the eigth having faced just three batters, but as previously indicated, the Nats offense seemed to lose their footing and couldn’t muster a reaction. Three runs home, two errors, a wild pitch, two hits, and a stolen base later, the Nats fell from a 2-1 deficit to a 5-1 deficit and couldn’t overcome that fact in the end. As it stands, though, Washington is still 30 games above .500 and maintains first place in the National League East with their closest competition – the Braves – still 6 games behind. So at the end of the day, all is not lost. 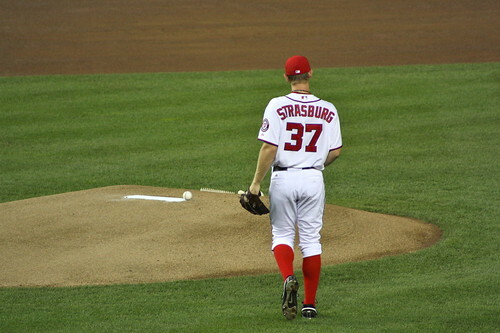 Now that Stephen Strasburg has made a full recovery from Tommy John surgery, all that’s left for fans of the Washington Nationals to hope for is that his starts in 2012 go a lot better than his start on Friday night, when Strasburg’s disastrous first inning turned out to be the difference in a 7-4 loss to the playoff-chasing Atlanta Braves (89-68). The start was officially delayed by 14 minutes while the field was given extra time to recover from the day-long rains that soaked the District. Whether it was this minor disruption of routine or the generally damp and humid conditions that affected Strasburg is not clear. However, he had trouble locating the strike zone in a 38-pitch first inning, and when either his four-seam or two-seam fastball did find the zone, it was carted all over the Nationals Park outfield. After Strasburg struck out Michael Bourn on a changeup to lead off the game, Martin Prado lined a single off the glove of Danny Espinosa. Chipper Jones followed by pulling a two-seam fastball into right field on a full count, sending Prado to third. Dan Uggla fisted another four-seam fastball into center field to score Prado, the game’s first run. After Brian McCann swung through a 97-mile-an-hour fastball, Freddie Freeman doubled Atlanta’s advantage by singling to right before Jack Wilson pulled a ground ball that should have gone straight into Ryan Zimmerman’s glove and ended the inning. However, the ball took a fat hop, nicked the heel of Zimmerman’s glove, and bounced to left field as Uggla crossed the plate to make it 3-0. Strasburg managed to retire Jason Heyward to end the inning, but the out came in the form of a 395-foot fly ball that drove Rick Ankiel to the warning track in dead center field and nearly ended the competitive portion of the game right then and there. Strasburg retired 9 of the next 10 batters and exited after the 4th inning with the Nationals trailing 3-1 thanks to an RBI single by Wilson Ramos in the second inning. However, Washington’s middle relief let them down. In particular, Collin Balester, who relieved Strasburg, made his predecessor’s performance seem masterful. Davey Johnson, trying to prolong his team’s five-game winning streak, pulled Balester after three batters and brought in Atahualpa Severino, who allowed both of his inherited runners to score on a double by Uggla, who came around himself on an RBI double by McCann. A night after hitting two solo home runs in a series opening 5-3 win over the Atlanta Braves, Rick Ankiel struck an even bigger blow. His grand slam in the bottom of the fourth inning turned a 3-2 deficit into a 6-3 lead, and the Washington Nationals went on to beat Atlanta 9-3 in front of 24,326 fans at Nationals Park Tuesday night. The grand slam was Ankiel’s only hit of the night (he finished 1-for-5), but it was the perfect capstone to a torrid homestand for the veteran pitcher-turned-center fielder. Ankiel entered Tuesday’s game with a .421 on-base percentage in 19 plate appearances during the homestand, while his two Monday night home runs goosed his slugging percentage up to .750. In the short term, Ankiel’s hot streak has been a timely contribution to Washington’s firepower while others have struggled. Most notably, Danny Espinosa has fallen off sharply from the giddy heights of, say, mid-July. The rookie second baseman’s one-out double in the bottom of the third was his first extra-base hit since July 17 (which also, coincidentally, came against the Braves). Between the next day’s 0-for-4 performance against the Houston Astros and the start of Tuesday night’s game, Espinosa –who went 2-for-5 on Tuesday night– had reached base just nine times in 57 plate appearances on four singles, four walks, and once taking first after being hit by a pitch. That worked out to a .161 on-base percentage, while striking out 17 times. Jayson Werth, who also went 2-for-5 Tuesday night has been hot as well (.440 on-base percentage and 1.011 OPS on the homestand entering the game), and it was he who scored the first run of the game in the bottom of the second inning. Werth, showing the same aggressive baserunning that’s marked his game all season, led off the inning with a single to right and took off for second with Michael Morse at the plate. Morse struck out on a full count, but David Ross’ throw sailed into center field and Werth took third base before scoring on Ian Desmond’s sacrifice fly. That lead only lasted until the top of the third inning, when John Lannan struggled for the only significant period in his 6.2 innings. Facing the bottom third of the Atlanta order, Lannan gave up singles to Ross and Jose Constanza. After Ross was retired on a failed sacrifice by starter Derek Lowe, Michael Bourn tied the game with a double down the right field line. Lowe himself came across when the next batter, Martin Prado, grounded out to Espinosa. The Braves increased their lead to 3-1 in the top of the fourth when Alex Gonzalez singled with one out, went to second on a single by Brooks Conrad, advanced to third on a deep fly ball by Ross, and scored when Constanzo drove a single over the leaping Ryan Zimmerman and into left field. But in the fourth, it all fell apart for Lowe, who has been a consistent disappointment for Atlanta since signing a four-year, $60 million contract with the Braves after the 2008 season. On Tuesday night, his sinker wasn’t as effective as it should have been, and the Nats finally got the measure of him. After Jonny Gomes walked with one out, Desmond pulled a sinker into left field for a single. Wilson Ramos fouled off a changeup before lining a sinker the other way to load the bases. Lannan then chopped a ground ball to first baseman Freddie Freeman, whose throw home to force Gomes was much too high and forced Ross to come well in front of the plate to make the catch. Gomes finished the job by taking out Ross’ legs with his own. It was a violent, but legal, play by Gomes and it cut the margin to 3-2. Then Ankiel watched two cutters miss high and outside before driving a sinker into the storage area behind the center field wall. It happens that quickly sometimes. Lowe made it out of the fourth without further damage to his ERA, but he only lasted two batters into the fifth. Left with no choice but to hope that his sinker would suddenly sink, Lowe kept throwing it, and the Nationals kept hitting. Specifically, Gomes lead off the fifth by tripling down the left field line and Desmond treated another thigh-high sinker with the contempt it deserved, lining it into the first row of the left field seats to make it 8-3. Michael Morse rounded off the home run derby in style with a long home run into the first row of the right center field balcony off Christhian Martinez to provide the final margin of victory in the bottom of the sixth. But the story once again was Ankiel, who, while he is not likely to be back with the club in 2012, has given the club some very fine service in center field (a below-average bat, perhaps, but his defense has not been close to the disaster many feared it would be). On a team that is simultaneously building toward the future and struggling to put its offense together, performances like Ankiel’s on this homestand are so often the difference between winning and losing, progress and frustration. Since Rick Ankiel returned from the purgatory that his pitching career had become and made his debut as an outfielder in August of 2007, he has hit 56 home runs. Prior to Monday night’s 5-3 Washington Nationals win over the Atlanta Braves, Ankiel had hit two home runs in a game on four occasions. Facing right-hander Jair Jurrjens, Ankiel took his career home run total to an even 60, hitting two solo shots into the right field seats as the Nats notched their third win in a row against a division opponent. Ankiel’s first home run, a solo cannon shot into the right-center field seats to lead off the bottom of the first inning, was impressive enough. But it paled in comparison to his second homer, another solo job that was blasted into the second deck down the right field line. As anyone who makes a habit of watching games at Nationals Park can tell you, those seats aren’t reached cheaply. The pitching match-up certainly didn’t favor the home side. Jurrjens, a 25-year-old from Curacao, had not lost a start since June 14, and is surely on the watch list for the National League Cy Young Award. By contrast, Livan Hernandez had not won a start since June 26, and hadn’t even made it past the 4th inning in two of his previous three appearances. In the first inning, the Cuban looked to be continuing his poor run of form. After giving up a lead-off single to Michael Bourn on the second pitch of the game, Martin Prado turned on a curveball that missed the left field foul pole by, at most, a foot. The next pitch was scalded to Ryan Zimmerman, who snagged the line drive on the back hand and threw to first in plenty of time to double off Bourn, who was left standing at second wondering how on earth the ball hadn’t gone for extra bases. The themes of danger and escape recurred throughout Hernandez’s six-inning, six-hit, one-run outing. In the third, he gave up a one-out single to Jose Constanza, who was promptly thrown out trying to steal second by Wilson Ramos. In the next inning, Hernandez allowed back-to-back one-out singles by Freddie Freeman and Dan Uggla before hitting Jason Heyward on the leg with a pitch to load the bases. The next batter, David Ross, grounded into a 6-4-3 double play to end the inning. Hernandez helped his own cause considerably on two occasions. In the second inning, Hernandez gave his team a lead that they never relinquished when his two-out single to right field scored Jayson Werth to put Washington on top 2-1. But his most spectacular moment came in the fifth. After a lead-off single by Alex Gonzalez, Jurrjens (batting in the 8th spot) dropped a very well-placed bunt in front of the plate. Springing off the mound with alacrity, Hernandez spun and fired a bullet to the covering Desmond at second to start the 1-6-3 twin killing, the third double play turned by the Nats on the evening. The only mistake Hernandez made was in the second inning, when he left a sinking fastball up in the zone for Uggla to catapult into the right-center field bleachers to tie the game 1-1. But even in this, Hernandez could commiserate with closer Drew Storen, who gave up Uggla’s second home run of the night with one out in the ninth inning. That made the score 5-3, and when Heyward followed with a single to right, nerves were jangling in the crowd of 19,940. But Storen managed to blow a full-count fastball by Ross and induce Gonzalez to ground into a 5-4 force-out to end the game.